Visitors to Korea are often struck by two seemingly contrary national qualities – one is traffic; with Seoul in particular being one of the world’s most heavily congested cities. Second is the pace of life, which despite all those busy roads, is at breakneck speed. Little wonder then, Korea is considered the most innovative nation on the planet. Piece together the world’s fastest internet infrastructure; a 24-hour shopping culture; the myriad of street vendors and small shops; the long working hours and a desire to quickly build a better, stronger and faster nation, and you get some idea of the environment in which delivery company, Kyung Dong Express operates. The number one business of its kind in Korea, it criss-crosses the entire country, with an army of delivery vehicles that are so common, they have almost become part of the country’s landscape. Founded in the early 1970s, the company originally focused on bulkier, containerised items, before the computer boom, a myriad of internet shoppers, and that desire for speed, propelled them into the parcel business. Over 3 decades later, the express men from 750 branches nationwide, are responsible for 300,000 deliveries of packages large and small, every day. “We are a family business,” says Baek Moon Hyun, the charismatic President of Kyung Dong International, part of the organisation which now also includes car rental and business logistics. Thanks to economies of scale, the Korean consumer also benefits from the widespread appeal of home deliveries. With the company’s rapid expansion into parcels, came a need for a fleet of forklifts capable of working hard and long hours. 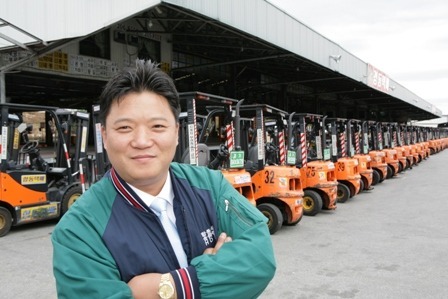 In 2000, the first 20 Doosan forklifts arrived at the company’s main hub in Kyung Dong. Typically, a large Korean firm will consider changing supplier every three years, but here, over nine years later and having purchased more than 250 trucks, Doosan remains the number one choice. During the day, banks of screens in the main control office flicker into life, showing real-time GPS locations of the delivery vehicles, plus the value of freight being moved and even the local weather conditions. Electronic signatures are received every second, and stored for up to 5 years on the ever-expanding wall of servers. At around 8pm, the forklift fleet comes to life, working up to an organised frenzy by 10pm. Working through the night to shift the day’s orders at top speed, the Doosan forklifts are there to do a job, being worked very hard and getting the operators through their shifts, and the deliveries on their way, as quickly as possible. Making sure the trucks are up and running each night is the responsibility of Doosan General Manager, Kwang Kyoun Shin. With backup from Doosan’s local representatives, the fleet remains in good health, and small modifications, such as side impact protection panels and a block to prevent waste from blocking the underside of the truck have been specially designed for the application. In keeping with the nature of the business, and even the nation, the success of the relationship comes down to time – a rapid response that is only possible with the experience built up over many years.